The Sky-liner Petites Highliner Collection is a Holiday 2014 offering by Marc Jacobs Beauty, a newcomer in the beauty world. 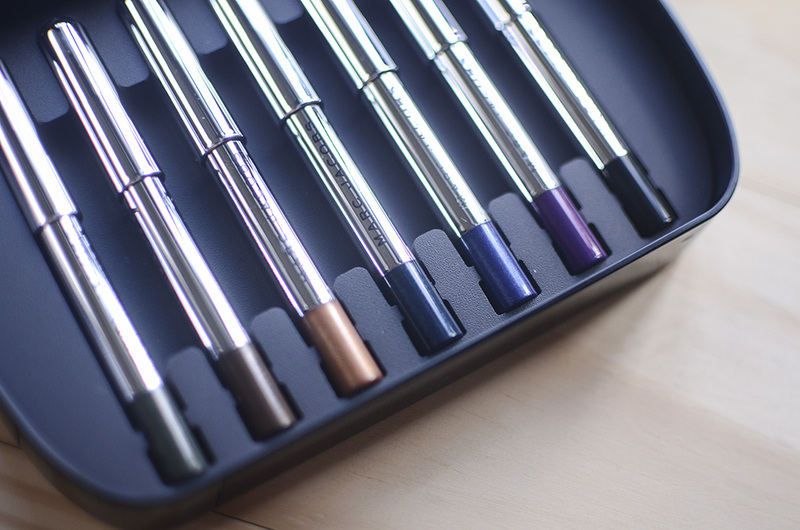 It features seven of the Highliner Gel Liner Crayon shades, which is basically his no-budge, high-pigment version of an eye pencil. These tiny little pencils come in a sleek and sturdy black plastic tin that can be reused and repurposed for storage. The shades in this set are: (O)Vert, Brown(Out), Sunset, Midnight in Paris, Th(Ink), (Plum)Age, and Blacquer. Sunset, a golden bronze shimmer, and Midnight in Paris, an inky indigo blue, are exclusive to this set. (O)Vert is a forest green. Brown(Out) is a bronze. Th(Ink) is a deep navy. (Plum)Age is a vivid purple, and Blacquer is your standard black. All of the shades in this set, except Blacquer, has shimmer. OK, I’ll put it out there right now: I hate the names. It makes me roll my eyes so much. I get it; I just don’t like it. They’re also really inconsistent with the format—sometimes the color part of the name is in the parentheses, sometimes they’re outside—and I just don’t like this naming device. 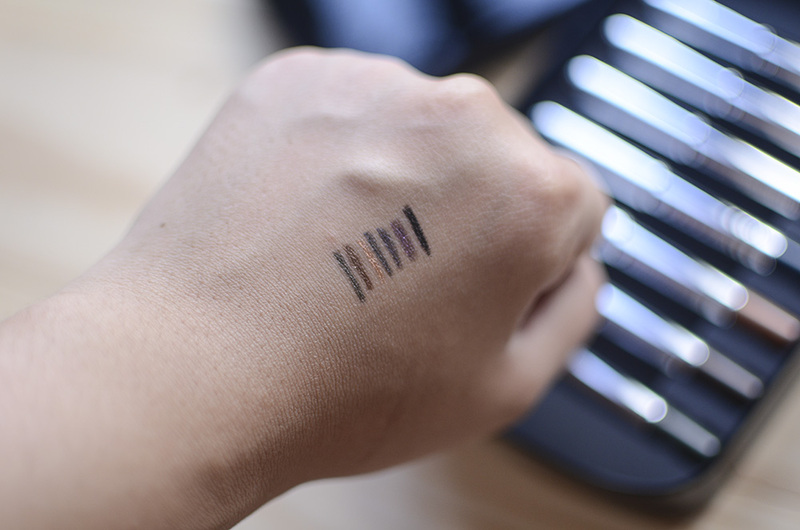 The formula of these is pretty unbelievable, when swatched on your hand. It did tend to wear off on my eyes, though, especially on my waterline. Nothing ever stays put on there, but I was hoping that this would. 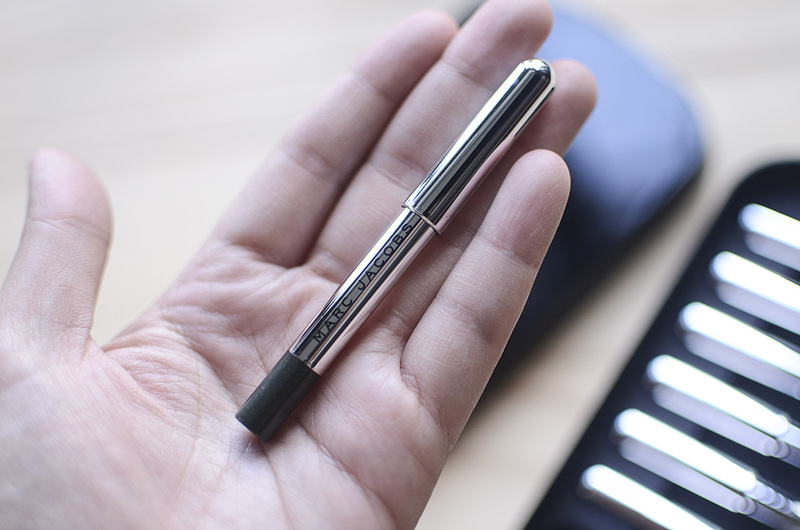 The texture is really creamy with Blacquer as the best at application, but as with most liners, my issue is more of longevity. I suppose this is still not my be-all, end-all colorful liner solution. I’ve kind of accepted that nothing will ever work on my waterline, but I don’t think that significant fading on my lids (even with primer!) is acceptable, at this price point. I was in Sephora in Santa Monica trying to make the choice about whether or not I should buy these and decided against it — I’m kinda glad I did. Yup, definitely not worth full price! This is a pretty set indeed. Love the packaging and the long lasting formulation. Great set of colors too. 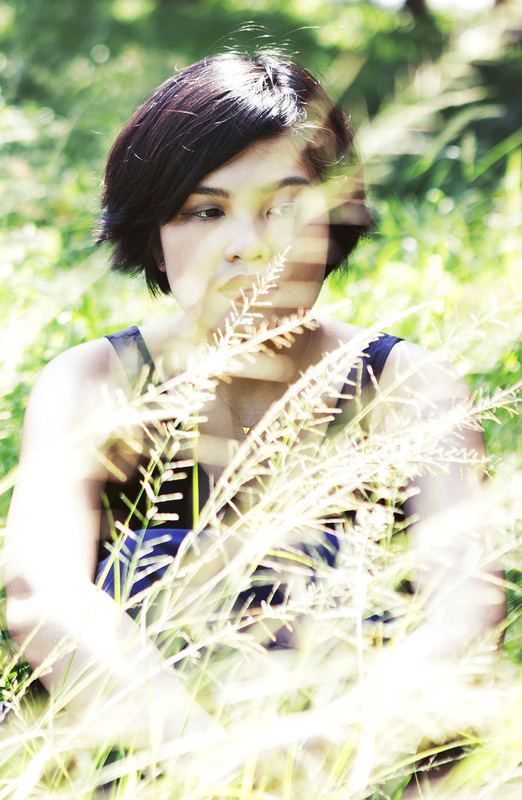 Oh ouch, I’m so sorry to hear about the fading! That’s the thing with all eyeliners really. The formula works for some but not all! I don’t use pencils that much, otherwise I totally would have wanted to try this set. I knooow, I think I’ll be sticking to gel liners if I want colored liners! Whoa that calculation is so taxing haha. But that is so weird of them to market their products like that but oh well. I think this is one of those example that when it’s expensive that doesn’t mean it’s guarantee flawless. I have yet blossomed a curiosity towards MJ makeup products, that is so weird considering I kind of want everything offered at Sephora haha. Right? Haha I would’ve put the more accurate description… or just put both! I’ve swatched the blushes and aside from the eye palettes and the base products, those are probably what I want the most. i’m sort of meh about these liners. I had rococoa (who knows where the parentheses are?) when it first came out and returned it because it wasn’t quite as good as others. I have a 100pt perk from sephora of brown out and i just tried it today.. Again, I’m feeling meh about it and finding it fades sooner than others I have… Oh well!